Today, that museum is known as the Royal Armouries and the collection has spread across three sites: the Tower of London, Leeds and Fort Nelson, Portsmouth. The main collections can trace their roots back to the sixteenth century, but 1916 marked their public transformation from Ordnance Stores, providing decoration for interiors across the Tower of London site and the wider world, to the national museum of arms and armour. 1916 also saw the Authorised Guide to the Tower of London revised to include a description of the new Tower Armouries' displays, and the publication of Inventory and Survey of the Armouries of the Tower of London Vol I and II by Charles ffoulkes, which is the first published catalogue of the Armouries' collections. These publications have been digitised for you to explore below. The Inventory and Survey of the Armouries of the Tower of London Vol I and II was the personal copy of Lord Dillon, which upon his death was returned to ffoulkes in 1933 for deposit in the Armouries' collection. It contains many annotations and insertions by ffoulkes and Dillon, and as such are unique. 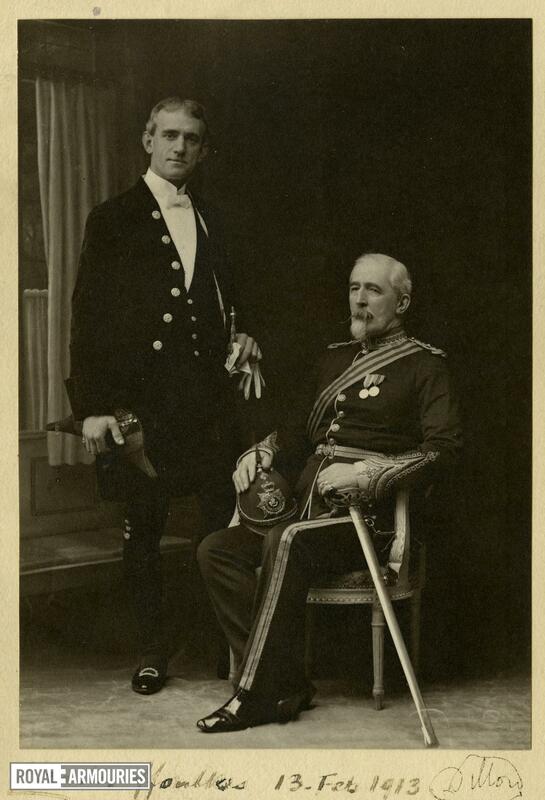 Charles ffoulkes (standing), Curator of the Armouries at the Tower of London, with his predecessor The Viscount Dillon in 1913. These publications have been digitised for you to explore. Selecting them will open another window and allow you to turn the pages and search their contents.